Truth by Kbaig: FAKE OLYMPIC VISA SCANDAL IN PAKISTAN..! 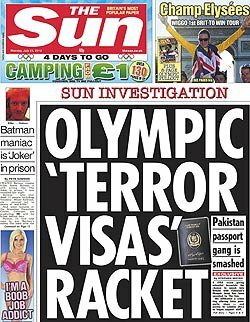 FAKE OLYMPIC VISA SCANDAL IN PAKISTAN..! British newspaper THE SUN disclosed a fake passport scandal in Pakistan and declared the agent involved in it as a secret man (007). Now it is clear that the who man is indulged in this fake passport scandal, is a Pakistani National Muhammad Ali Asad. If Shakeel Afridi is declared as agent of enemy and imprisoned for helping other country's intelligence agency against Pakistan, shouldn't the under cover Pakistani reporter who got fake passport also be treated similarly to curb future anti-state elements, helping foreigners for money but become tools of enemy. If you remember in January 2010 HAMAS Leader Mahmoud AL-Mabous was assassinated by Israeli agents in Dubai. All MOSSAD agents entered in Dubai as a British Nationals on British passports. After that Britain announced that Israel stole the identities of 12 British citizens to temper the fake passports in London.Thereafter British Govt. expelled the murderers and everyone is silent. When the British news-paper discuses over Pakistani passport system why they forget murder of HAMAS leader and also why the loopholes of British VISA proces remains unquestioned and only passport scandal is being highlighted? Who was the agent in British embassy who issued visa on a tempered or fake passport? How did MOSSAD agents succeeded in getting British passports, or this was a deal between higher ups of British and Israel? Would anyone answer these question?